Mineral conditioning and pH control can greatly affect flotation performance. Most mineral beneficiation processes require some type of pH adjustment to impart ideal separation conditions. As mineral feed quality continues to decrease, more sophisticated pH modifiers are needed to achieve optimum flotation performance. In many cases, the traditional commodity means of altering pH and the application of old chemistries do not provide the selectivity required to achieve modern mineral grade requirements. Commodity-type pH modifiers no longer deliver the best cost performance. A custom formulated pH modifier is needed to provide better froth structure and gangue selectivity for improved grade, and to create ideal conditions for increased recovery. ArrMaz’s line of tailor-made pH modifiers increases the efficiency of the flotation process by facilitating optimum zeta potential, and creating ideal conditions for collector function and mineral separation. They sequester soluble divalent ions which could potentially increase flotation collector usage and decrease collector efficiency, and they also help reduce the negative impact of water quality on reagent consumption. 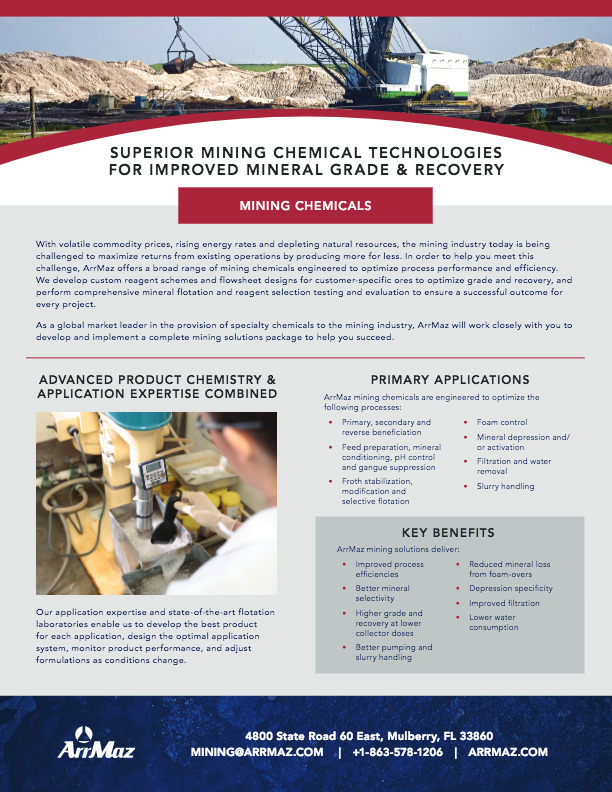 Our proprietary surfactants clean and prepare the mineral surface for efficient collector performance, and our pH modifiers selectively inhibit the interaction of gangue minerals with the flotation collector while promoting collector deposition upon the preferred mineral surface. By precisely formulating our pH modifiers for your process we can achieve better migration of mineral-laden bubbles into the froth collection zone for a faster float, cleaner concentrate and higher mineral recovery.